I have had the pleasure of working on thousands and thousands of cats in my medical career. When I started practice back towards the end of 1981 the average cat lived to be about 10-12 years of age. 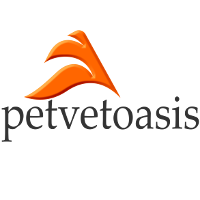 With the advancements of veterinary medicine and technology over the years that has been extended to about 16 years of age. The oldest cat that I ever treated was one in Ohio that was 23 years of age! It was an INDOOR only cat! Outdoor cats almost never live to be that ripe age. If they did it was by sheer luck alone. For way too many years cats have been treated like second class citizens even though cats outnumber dogs as pets in the U.S. There are even veterinarians that still treat cats like dogs. Impossible! They are two different species and have to be treated as such. Outdoor cats rarely live to be 10 years of age. Many cultures around the world think that cats do not live indoors. They are “wild”, “independent”, “aloof”, “rodent hunter” and the name calling goes on. The legal profession even has problems dealing with cats. They are deemed as normally outdoor animals, rodent catchers and able to fend for themselves. Most states and municipalities have multiple laws for dog ownership but few exist for cats. The Michigan State University College of Law published an interesting paper on the subject. There are some basic definitions that have to be cleared up. An indoor cat is a cat that stays inside 100% of the time. If it suns itself on the front patio for 5 minutes once a month it is an outdoor cat. Multiple things can go wrong in 5 minutes. I have treated those disasters that happened in 5 minutes or less. A feral cat is a cat that has never been indoors. It was born outdoors, has never been socialized or exposed to humans and acts more like its relatives in the jungles of Africa. They are extremely dangerous to handle. Any veterinarian that has done neutering by the “trap and release” method knows what I am talking about. Why do outdoor cats live shorter lives than indoor cats? Read on. The journey begins. The great thing about cats is that they are small, nimble and quick. They have an uncanny ability to escape car accidents by the width of a cat whisker. They are also very lucky. Just think what a large buck can do to itself after meeting a car in November during mating season! This animal is huge! The average cat is ten pounds and doesn’t stand a chance being hit broadside by any vehicle. If it is lucky it will bounce off the side of the vehicle with minor, non-life-threatening injuries. Outside of being “pilled” cats hate two things; being wet and being cold. Outdoor cats also love to crawl in inaccessible places to hide. Many times this includes under the hood of the car. Outdoor cats will find a warm engine block quite comforting during a cool evening. The problem is that the fan belt is in that same neck of the woods. 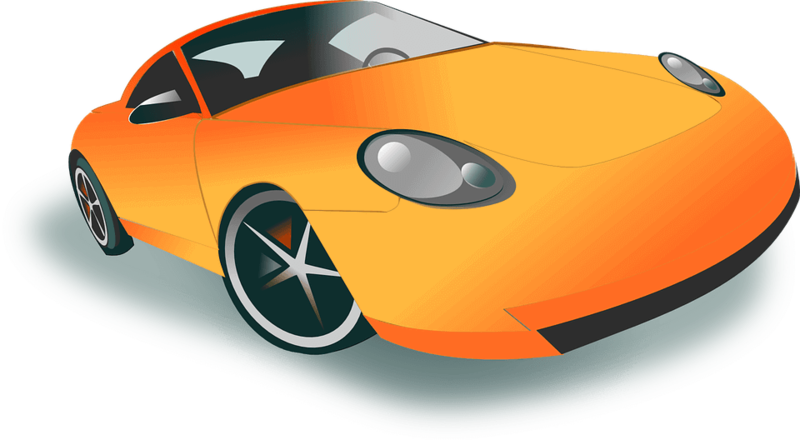 An owner turns on the car and disaster occurs. I have treated: bone fractures, eviscerations and multiple lacerations from such incidents. TIP OF THE DAY- As you approach your vehicle always tap the hood several times to scare away any cat that might be lurking under the hood. Outdoor cats do not stand a chance when confronted with large animals such as wolves and coyotes. Humans even have to worry about them when living in areas where those species are prevalent. Even people are not at the top of the food chain all the time! 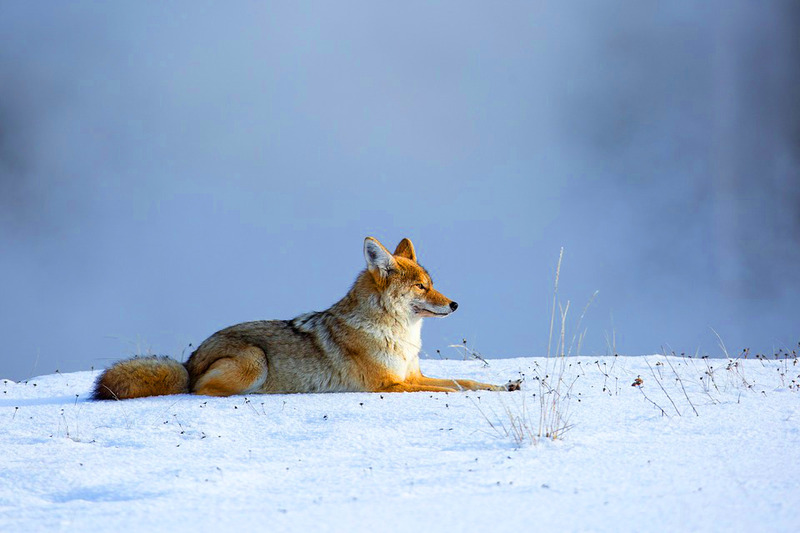 That coyote above may appear calm and placid but don’t let that fool you. Inside of its mouth are long canines and incisors that can snap the neck of a cat in 1 nanosecond. 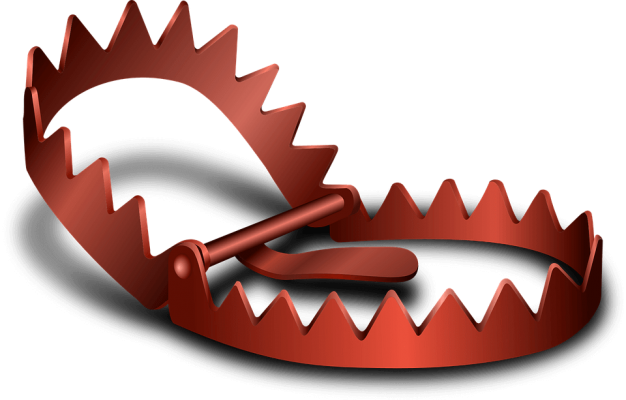 Animal traps are placed in rural areas of the country to catch wild animals for food or for their fur. The pressure that one of these traps puts down on an animal is tremendous. Outdoor cats can be crushed and killed by them. Limbs will be fractured; and if the cat is lucky to be found will probably have the limb amputated at an animal hospital. Trappers often forget where they have put traps so they can lie for decades waiting for an unsuspecting cat to come along. Raccoons and groundhogs can cause severe injury to outdoor cats. The problem lies in that both cats and raccoons are nocturnal animals. That is why you never see outdoor cats suffering from heat stroke because they are sleeping in the shade during the heat of the day. At night these two animals will cross paths. Raccoons may be small animals but are just as quick as a cat. 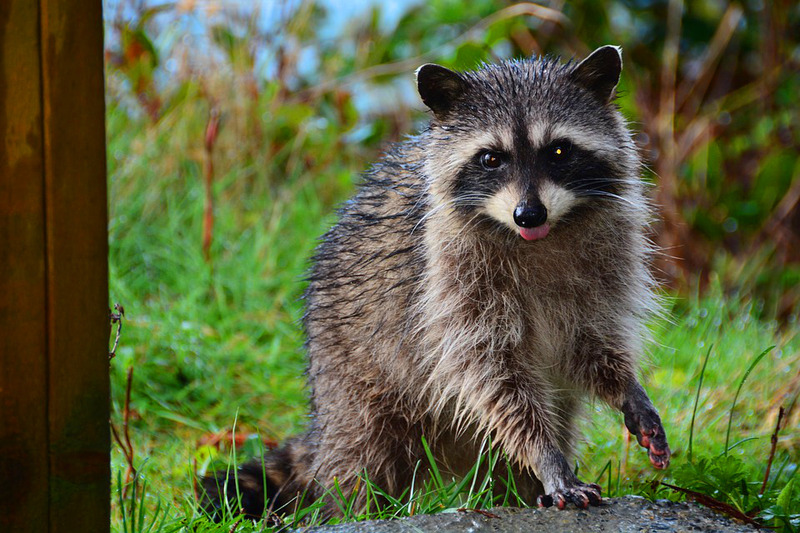 Raccoons can easily bite a cat leading to an infected wound. Groundhogs will take chunks of flesh from a cat. The cat looks like a sandwich that someone had just taken a bite from! TIP- If you see a raccoon wandering around during the daytime do not approach it. This activity is abnormal. The animal is probably suffering the neurological signs of canine distemper OR RABIES! Do not take a chance as raccoons are reservoirs or carriers of the rabies virus! This is another reason why all cats (not just outdoor cats) should be vaccinated against rabies. The outdoor cat may be bitten by a raccoon. The cat then comes home TO YOU! Do not take a chance on transmission; which is always by the bite wound of an infected mammal! Even a mouse (which is a mammal) can carry the rabies virus! Rabies transmission was discussed earlier but there are other diseases that outdoor cats are exposed to if they are not vaccinated against them. Feline Leukemia and Feline Immunodeficiency Virus (especially in male cats) are easily transmitted by close contact with infected animals or their secretions (Feline Leukemia) or by bite wounds (Feline Immunodeficiency Virus). Even if your cat is vaccinated why take a chance having the vaccine challenged?!! Most vaccines are extremely effective against preventing disease but none are perfect. Outdoor cats are also exposed to a slew of respiratory viruses that can make them not only miserable but also extremely sick. Examples of this are: calicivirus, feline herpes virus and feline rhinotracheitis. 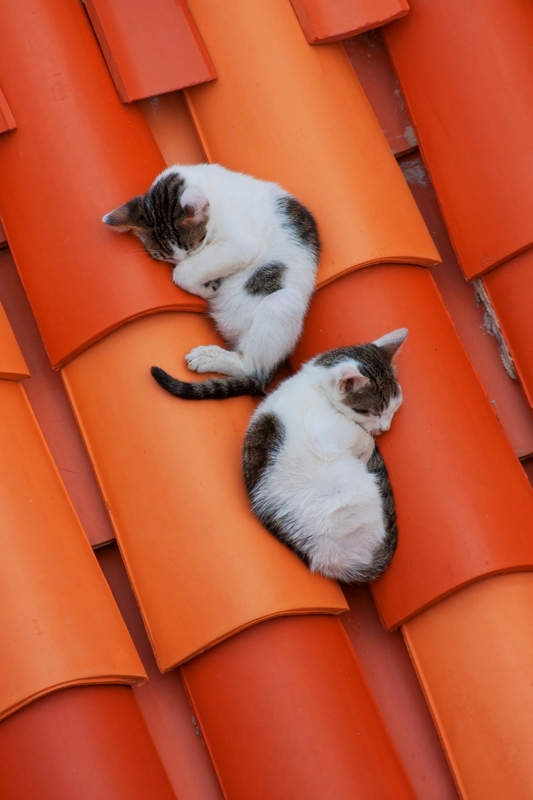 When outdoor cats suffer wounds or injuries from any of the above scenarios they often hide. They return home only when they are on their last legs. Even simple bite wounds can turn life threatening. A huge abscess may form which leads to sepsisPeople have always heard of someone that died of sepsis but do not know what it means. Sepsis is the presence of bacteria and their toxins in the blood stream. It is the toxins that lead to renal failure and eventual death., which leads to renal failure, which leads to death. What about a pregnant, indoor cat about ready to go into labor? Cats are notorious about sliding threw any crack in an opened door. They may take that route and attempt to deliver their kittens. That indoor cat now has turned into an outdoor cat! The animal could develop uterine inertiaThis term refers to the uterine tone during delivery. The uterus is a muscle like the ones on your arms and legs. The job of that uterine muscle is to support the developing fetus plus to expel it during delivery. The hormone, oxytocin, stimulates those contractions but wears out over time. The uterine muscle get tired and stops contracting. This is uterine inertia. and require a cesareanThe origin of the term cesarean originated in ancient roman times. It was originally thought that Julius Caesar was delivered by cesarean section. There was also the lex cesarea or roman law that stated that if a pregnant woman died during delivery her unborn child would be taken out from her. section but no one would know about it! The chances of any mother or her kittens surviving that would be impossible without medical intervention.